Quick review of 3 Card Brag. 3 Card Brag is an uncommon casino game that involves trying to make the best 3-card poker(ish) hand you can. You can either wager on beating the dealer, or simply bet on making a strong enough hand to warrant a payout. "3 Card Brag" is very similar to 3 Card Poker. In fact, after a good night out on the town I doubt you’d be able to tell the difference between the two. This version of the game is slightly different to the one you might have played down the pub with friends, because in this version you’re playing against a dealer (the casino kind). Nonetheless it’s a fine alternative for anyone looking to play 3 Card Brag online for fun or for real money. 3 Card Brag fun rating - 68%. Three Card Brag is a very enjoyable casino-style game. It’s one of those relaxing games where you can sit back, drink some hot chocolate and play some cards in the hope of hitting a big win or two. Even if you’re not a big hot chocolate fan, I’m sure you’ll enjoy playing 3 Card Brag anyway. As far as interactivity goes, there is a small element of skill involved when it comes to either playing on or folding (you can find out more about this later), but it’s not quite as strategic as a game of Blackjack. This game isn’t going to excite you like Spin Win will, nor does it have a massive max payout like real money Cubis. However, 3 Card Brag is the kind of game that the casual weekend gambler will love. How to play 3 Card Brag. The basic rules of 3 Card Brag. Ante. Bet that you’ll make a better hand than the dealer. Pair bonus. Bet that you’ll make a hand that qualifies for a payout. The better the hand the bigger the payout. The dealer’s hand is irrelevant. After clicking "Deal" you and the dealer will be dealt 3 cards. The dealer’s cards will be face-down. If you bet on "ante" and you think your hand is good enough to beat the dealer’s, you have to place another bet (equal to the size of your original bet) by clicking "Play". The dealer’s hand is then turned over. If you have the best hand, you win. If not, you lose. 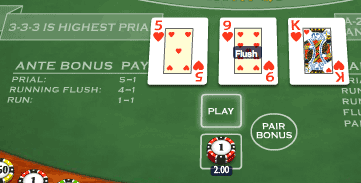 If you bet on "pair bonus" you simply have to hope that the 3 cards you are dealt qualify for a payout. The payouts vary depending on the strength of the hand you are dealt. The rank of hands in 3 Card Brag is as follows; pair, flush, run, running flush, prial. Three Card Brag is incredibly similar to Three Card Poker. One of the main differences is the slight variation in the rank of hands. For example, three of a kind is the best hand in 3-Card Brag, whereas a straight flush is the best type of hand in Three Card Poker. 3 Card Brag rules in more detail. When you first play 3 Card Brag online it can seem quite confusing. However, once you’ve learnt the rank of hands and understand the two different betting options it’s very straightforward. 3 Card Brag rank of hands. If you’ve ever played poker before, the rank of hands in 3 Card Brag should be a doddle. The types of hands are pretty much the same, except that they have different names and are in a slightly different order. Non-qualifying hand. This only applies to the dealer when he only has a "high card" hand and his highest card is lower than a queen. High card. You do not have a pair or better (e.g. K, 7, 2). Pair. Two cards of the same value (e.g. 8, 8, K). Flush. Three cards of the same suit (e.g. three spades). Run. Three cards of different value in a row (e.g. 5, 6, 7). This is known as a straight in poker. Running flush. Three cards of the same suit in a row (e.g. 8, 9, 10 of diamonds). This is known as a straight flush in poker. Prial. Three cards of the same value (e.g. Q, Q, Q). This is also known as three of a kind in poker. Note 1: The strongest possible hand in 3 Card Brag is a Prial using three 3’s (e.g. 3, 3, 3). The second strongest hand would then be three Aces. Note 2: The strongest run and running flush is; A, 2, 3, as opposed to; A, K, Q. 3 Card Brag betting options. "Ante" - betting against the dealer. "Pair bonus" - not betting against the dealer. 1) "Ante" - betting against the dealer. Both you and the dealer are dealt 3 cards. The dealer’s cards will be face down at first. Your aim is to be dealt a stronger hand than the dealer’s. 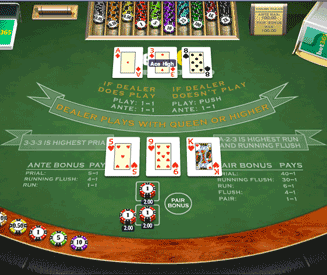 At the start of this game, you place your bet on the "Ante" section of the table. 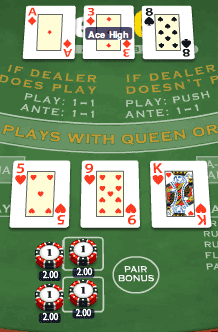 After clicking "Deal", you and the dealer will be dealt 3 cards, with the dealer’s cards being face-down. You now have the option to "play or "fold". Play - If you like the look of you hand and you think it will be the dealer’s, you should choose "play". By selecting play you have to place another bet on the table equal to the size of your original bet. So if you bet £1 at the start, you will have to place another £1 on the table, making a total bet of £2. Fold - If you do not like the look of your hand, you should select "fold". If you fold you lose your initial bet (e.g. £1 if we’re using the same example as above), but you save yourself from losing any additional money by placing further bets and losing to a better hand. If you have the best hand and the dealer’s hand qualifies, you win 1x both of your bets from the "ante" and "play". So if you originally bet £2 and decided to play, you would be returned £8 (£4 stake + £4 winnings) in total. If you have the best/any hand and the dealer’s hand doesn’t qualify, you win 1x your stake for the "ante" and your bet for "play" is returned (without any winnings). So if you originally bet £2 and decided to play, you would be returned £6 (£4 stake + £2 winnings) in total. If you decide to play but have the worst hand, you lose both your ante and additional play bet. Therefore, if your original bet was £2, you would lose £4 (£2 + the £2 additional bet) in total. In addition to the standard payouts for beating the dealer’s hand, there are a few small bonus payouts for making especially strong hands. Note: The payouts for making certain strength hands in this game are not as big as they are when you are not playing against the dealer in the "pair bonus" game. 2) "Pair bonus" - not betting against the dealer. In this game of 3 Card Brag it doesn’t matter what the dealer’s cards are. Instead, you simply have to hope that you make a strong hand with the 3 cards you are dealt. The stronger your hand is, the bigger the payout. You just place your bet on the table and receive your 3 cards. No need for any other extra bets. The pair bonus game in 3 Card Brag is simpler with bigger payouts, but in general it’s not as easy to win money from each individual game as it is with the standard "ante" bet. Fact: If you get a Prial when playing pair bonus, you get a 40x payout. If you get a Prial in the standard dealer game on the other hand, you only get a 5x payout.